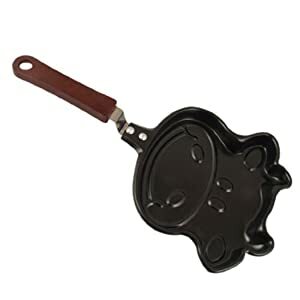 Fun Pancake Pans For Kids and Adults Add to Flipboard Magazine. I love pancakes and I know that kids do too. 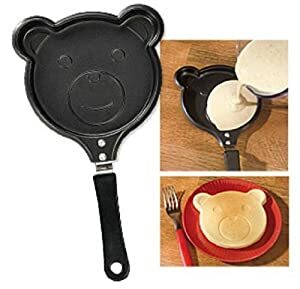 But do you have a fun pancake pan? No? Neither do it, but I love these. Kids always get so much delight when you create a funny face or a smiley face on their pancakes. 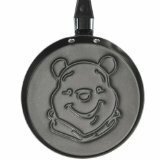 Now you can create faces, or zoo animals or even Disney characters right on their pancakes with fun pancake pans. My kids would have loved these and I am thinking my grand kids will too. When my kids were young I made pancakes a couple times a week and I would make extra so we could have them for lunch. We used them as bread for peanut butter and jelly. The kids thought there were fun, but I knew I was just being thrifty. They were none the wiser, but they were happy. Isn’t that all that really matters? 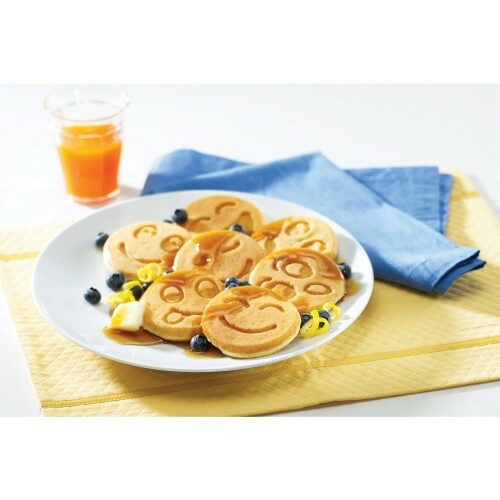 Seven different smiley faces to delight your kids! I used to make the smiley faces myself by just dribbling some dough on the pan in the shape of a smiley face. Sometimes it worked and sometimes it didn’t. This will make them perfect every time. There are seven different smiley faces to choose from. Why not make them all or let your kids choose which one is there favorite. Imagine the fun you will have with these great smiley faces. 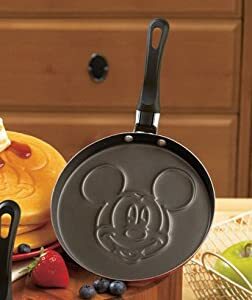 The pan is a non-stick surface, so it will make clean up a snap. No more scrubbing the pancake pan with the batter scorched all over it. Snap…it’s done! Seven Fun Animal Shapes! Every child loves the Zoo and dreams of having wild animals as their friends. 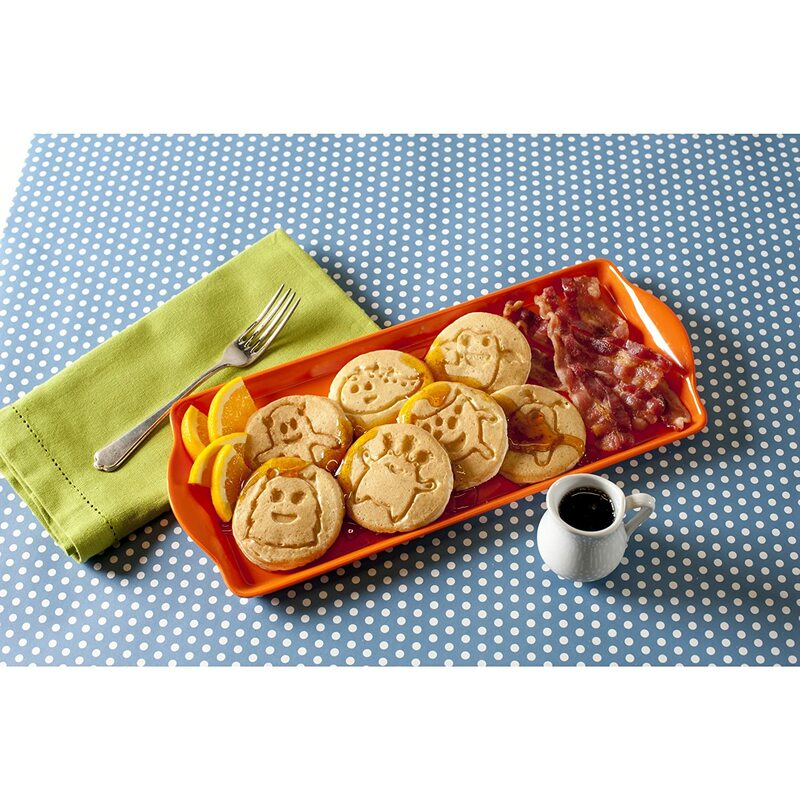 Now you can delight them and their imagination over breakfast with their Zoo Friends. 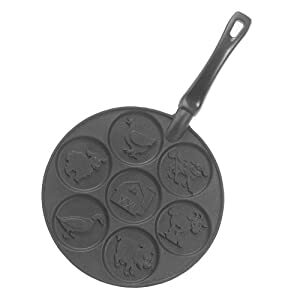 The animals in this pan are a monkey, hippo, giraffe, elephant, rhinoceros, lion and alligator. This is a non-stick pan, so you don’t have to worry about clean up. It is fast and easy. 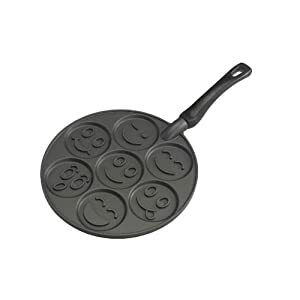 This pan can be used on both electric and gas stoves. Wake up your little monster with monster cakes. Every kid will love these for breakfast, lunch or dinner. They will have fun playing with them and coming up with wild stories about monsters in their mouths. 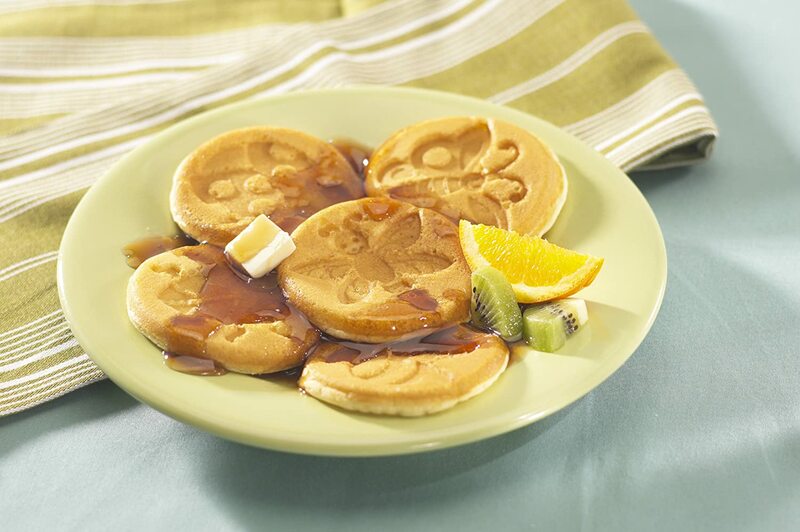 Fun will erupt from these fun monster pancakes. Seven different monsters will light up their plate. The non-stick pan will make you look like a super star, but only you know that the clean up will be a snap. Seven different bugs to delight your bug lover! Do you have a little one that is just fascinated with bugs? 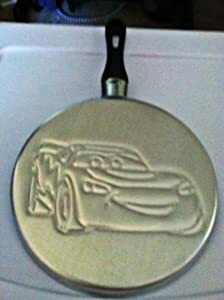 Then you are going to love this pan. 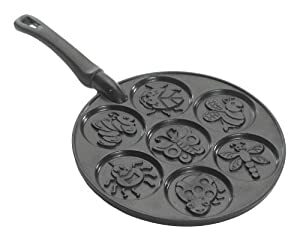 There are seven different types of bugs on this pan; a dragonfly, snail, butterfly, ladybug, spider, bee, worm and beetle. It is a non-stick pan, so no worries about clean up. You can use your favorite recipe or there is one that comes with the pan you can try as well. Surprise your kids tomorrow with great backyard bugs pancakes. 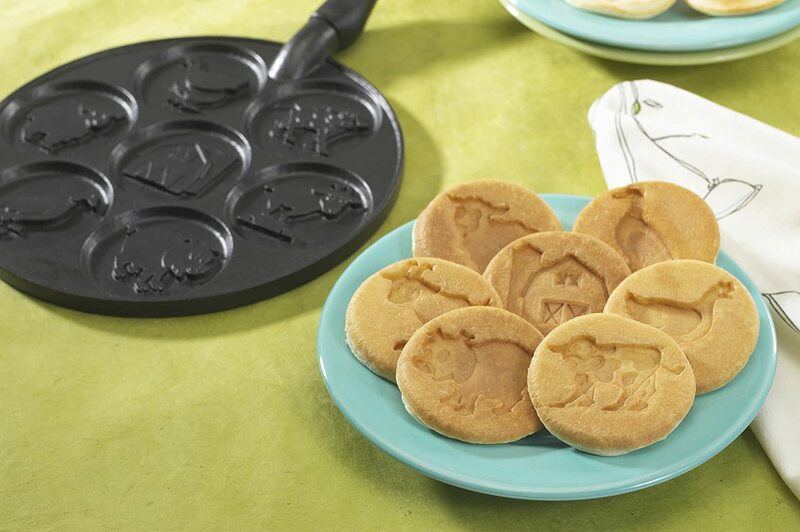 Seven fun barnyard shapes to make into pancakes. Even if you don’t live on a farm, kids seem to love farm animals. They will giggle when they wake up to Barnyard cakes. 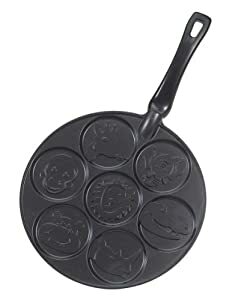 There are seven great barnyard shapes on this pan; cow, pig, sheep, goat, chicken, duck and barn. It is a non-stick pan so clean up is a breeze. Have fun with these new shapes with your little ones today. You can always make fun pancakes free hand like our mothers always did. Here are some great videos on how to make a few fun animals. 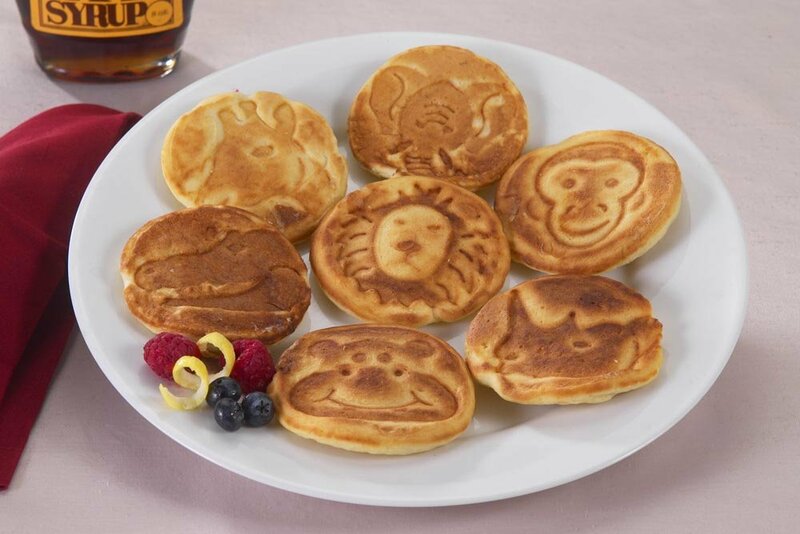 Some of your kids favorite characters come alive in pancakes. Kids sometimes have the idea that if they are “big kids” they need big pancakes like dad. 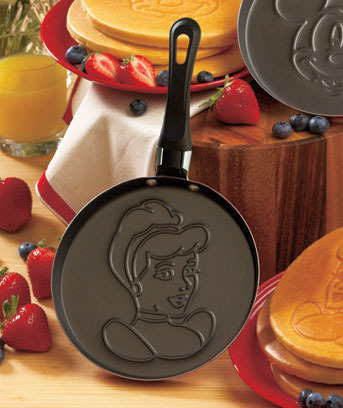 These are the perfect fun pans for “big” pancakes. 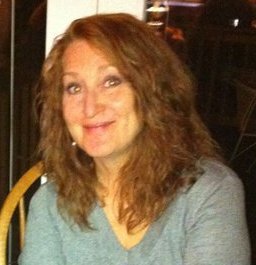 Choose from great characters and fun images that your kids may like. You can use your own recipe or try the one that comes with the pan. Either way, just go forth and bake what will delight your little ones. Believe me, they will remember this act of kindness that you show them for years to come. Mine sure do. Funny how kids remember the oddest things that we never give a thought to. Just enjoy being a parent…that is the best part of raising kids. I just had to add this because I thought it was such a good idea. My kids never got to the table at the same time and it is difficult keeping the pancakes warm. 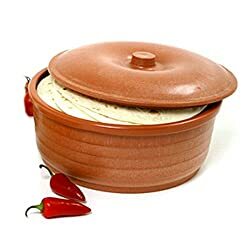 This is an insulated dish that is microwave safe and will keep the food warm till the family arrives. What a great idea!!! Did you find your favorite? More important than that…did you find your kids favorite? What are you waiting for? Grab it and get cooking. 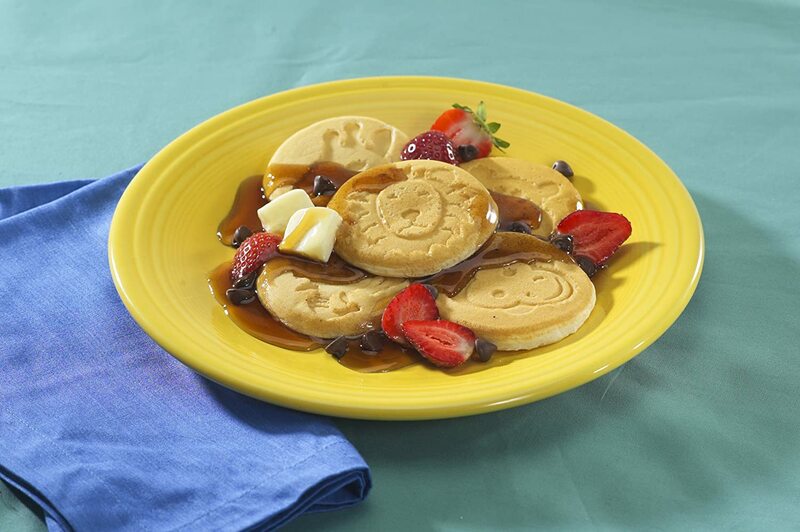 Tomorrow morning is the perfect time to surprise them with these fun pancakes for breakfast. Previous Post What Is The Best Vacuum To Buy?